In Czechs Today I am delighted to introduce Charlotta Kotik, the Curator of Contemporary Art at the world-renowned Brooklyn Museum of Art in New York City. Energetic and quick on her feet, she encouraged me to stay for a meeting she had with an artist to discuss a future project. A painter showed sketches of iconic figures, such as Vincent Van Gogh, interpreted by an autistic student he works with. Their conversation was just the beginning of creating a future exhibit. Charlotta Kotik Charlotta Kotik has been working at the Brooklyn Museum of Art since 1983. Along with promoting local artists and seeking fresh initiatives, she has curated numerous international travelling exhibitions. At the time of my visit, a Retrospective of Jean-Michel Basquiat was on view at the museum. A Brooklyn born and raised painter, he was the son of a Haitian-American father and a Puerto Rican mother. It led me to ask Mrs. Kotik, what does it take to be a curator in such a culturally and socially diverse community as Brooklyn? "It's a very interesting thing because first of all remember I am one of those immigrants to Brooklyn also being Czech, so in some way I feel very much a part of the community. I'm always seeking out different groups and artists from different backgrounds because I find it very interesting that we all can function within this one Borough, within this one large New York. Obviously it requires sensitivity and understanding of different cultural backgrounds, different traditions; different values systems; different feelings towards family and neighbours; all of these things create the cultural pattern of each group. This is very interesting for me because it's a sort of sociological work, which I find very exciting because ultimately art itself is very much an expression of these forces that create the individual and all of these forces grow out of their particular background." What made you decide to dedicate your life to art and the history of art? "I'm afraid it wasn't so much my decision I think it was genetic. Everybody in the family was involved with arts. I made an attempt in my mind, more than factual, that maybe I will do something else; maybe I will study chemistry. It just didn't work out because I didn't have any abilities. The only thing which I knew, I wouldn't say well, but better was the world of art because my mother was a musician, my father was an art historian; my aunt was an art historian, my grandfather was a painter, so there was practically no escape." Charlotta Kotik's background paved the way to her to being a leader in New York's complex art world. As a child her parents were divorced and she lived in what her family called, "the Women's Republic." "I was brought up in a family of my grandmother, Bohumila Masarykova Slavickova, and my aunt, Anna Masarykova, and my mother, Herberta Masarykova. And so, we were four women living together." "We were just women who happened to be living together. My Grandmother was a widow, my aunt wasn't married, my mother was divorced, and I was just the baby. But, you know, we managed and I think it made me aware of the fact that one can be independent." Her father, Emanuel Poche, was a well-known art historian and famed for writing a guide to Prague called, Prague Step By Step, or Prahou Krok za Krokem. His tireless work ethic and strict lessons were a great influence on Charlotta. "I visited with my father every weekend and it was very instructive. He taught me a lot about, A) discipline B) Prague and C) he was attempting to teach me Latin, I was not a very good student. He was trying to teach me Latin inscriptions on buildings and dates and I remember them until today, so it was very good. He also was interested in decorative arts, and modern, new decorative arts. He was very interested in modern glass, or then contemporary glass and ceramics and textiles. He was the Director of the Museum of Applied Arts and for me, that was just another connection to contemporary culture." Though Charlotta had rich relations with the artistic side of her family, growing up under the communist regime was difficult due to her political heritage; her great grandfather, Tomas Garrigue Masaryk, was a liberal leader and the first President of independent Czechoslovakia. She described feeling pushed to the edge of society under the regime. It wasn't until five years after she finished high school that she was allowed to enrol in night school while maintaining full-time work. 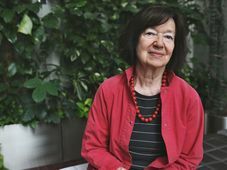 She managed to complete her Masters Degree in Art History at Charles University in 1968. "It was tough because at that time we still worked on Saturday mornings, so it was really a full work week, I worked at the National Art Gallery at the time, and then trying to do exams. Full-time job, and then exams, it was rough. Maybe it was good preparation for coming here and having to work non-stop, or as they say here, twenty-four-seven, which I do all the time." In January of 1970, Charlotta Kotik emigrated with her son, Tomas, to the United States. Her husband Peter had already been teaching music composition at the State University of New York in Buffalo. It was a very difficult decision to leave the rest of her family, and her beloved Prague. "I feel leaving a country is good if the country is in great shape and you leave things in good order. If you leave something that is not in good order, which is needy, which maybe needs help, one shouldn't leave. I had guilt for leaving precisely at that time because I felt I should have stayed and made things better there. I felt it was my responsibility. And also, I don't like to run. I don't like to walk away from things because I would like to solve them. Sometimes they are not solvable by one person, by one individual, but I think we all have to try and walking away from things is not the solution." Charlotte Garrigue Masaryk Today Mrs. Kotik keeps her feet in both countries, so to speak. 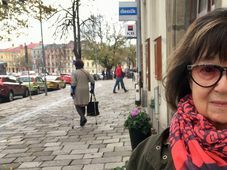 She sits on the board of the Contemporary Art Centre in Prague and her youngest son, Jan, carries on the artistic tradition of the family as a visual artist and has moved back to the Czech Republic. "The one who was born in Prague lives in Brooklyn and the one who was born in Buffalo lives in Prague now. I felt fine about it I just thought it's far. Now that we have a grandchild, in some ways I feel that fate is coming back. When my mother was so far away while our children were growing up, it was very painful for her. I am privileged, I can travel back. She couldn't travel for here for the first few years that we were living here. But still it's far. I will not see those first steps or those everyday changes of expression." Brooklyn also happens to be the birthplace of Mrs. Kotik's great grandmother, making her story even more of a full circle. She was even given the name, Charlotta, after her great grandmother Charlotte Garrigue Masaryk, the wife of first president of independent Czechoslovakia. Being born after the Second World War she wasn't allowed to use her first name because of the its symbolism and it was translated to Karla. 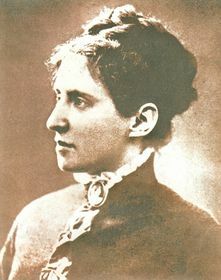 Once she immigrated to the United States she was immediately naturalized to Charlotte and eventually changed her name to what it was originally intended, Charlotta.